Visiting a garage or a workshop is equally as exciting as travelling to a new country. You won't know what you'll see until you actually went in. When I was in Japan some time ago, I made my way to one of the world's famous tuner house, NISMO at Omori, before its relocation to Yokohama. A first time visit that is worth sharing to all Nissan fans out there. Nismo is a racing/tuning division of Nissan, well known for its involvement in motorsports and obsession to develop, improve and provide higher level of performance tuning to the customers of Nissan owners. Omori Factory serves as the tuning center for GT-Rs, Fairladys and other selected Nissan models. Apart from providing service to customers, they are responsible for building competition car and complete cars. 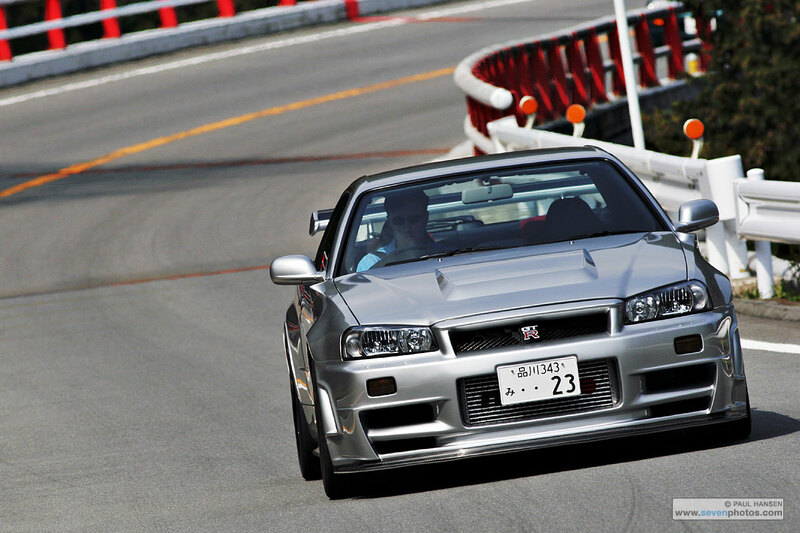 Some of the famous and limited GT-Rs were born here: Nismo 400R and GT-R R34 Z-Tune. Omori Factory is the holyground of Nissan motorsport. The early Nismo Omori Factory was situated in Omori District, about 4min walking distance from the nearest Omorikaigan Station. To be honest, the plain and dull building of Nismo didn't convince me enough that there is anything interesting to see. From outside, you'd never thought it's a major tuning center for the Skylines. Seeing a GT-R (R35) here tells me that I was at the right place. The GT-R had a nice number twenty-three on its Kawagoe plate. For some who might not know, #23 is Ni-San in Japanese which directly translates to the word Nissan. Meaningful car plates like this are favourites among Nissan enthusiasts. #2335, #··35, #··23, and so on. Another familiar Bayside Blue Skyline came back from its drive test while I was inspecting the GT-R. It was a 25 GT-T (ER34), a variation of the Skyline family. GT-T doesn't wear any GT-R badge and less powerful compared to GT-R R34. Its 2.5L RB25DET NEO turbo I6 engine produces 280hp (R34 actually have 327hp but advertised as 280hp) on its rear wheels. Let's say the GT-T is a softer version of the mighty GT-R class. ... and, some used mechanical components of the RB26 engine and memorable parts from the previous SuperGT GT500 race car. After much exploring outside, it was time to head into the Nismo store! This was how the entrance area looked like. Simple area decorated with Nismo trademark red vinyl. And on the left, a crowd of Japanese Nissan fans were there to watch the starting of Round 7 SuperGT race at Autopolis Circuit (30/9/2012) and were cheering for their favourite Nissan teams. Motorsport culture in Japan are in many ways different from Malaysia, car fans and enthusiasts here are more active and supportive with their national motorsport events. There was also a Nissan race car on display in the Nismo building. I'll check on that later. At the entrance area just now, there's a door on the right that lead to Nismo customer lounge area where customers can seek advice from Nismo technical advisor for potential performance upgrades based on their objectives and goals. They get to choose a variety of tuning options from basic drivetrain, brakes and exhaust upgrades, to full-blown engine swapping and racing specification tuning. Choosing Nismo Omori Factory over other third party tuning shops is a big advantage because you receive original Nissan levels of high quality service. More Nismo goodies and diecast collections could be found for sale here. ... Fairlady Z Type 380RS! The pumped up Nismo version of the 350Z is limited to only 300 cars. Its original 3.5L VQ35HR engine is stroked and bored to 3.8L outputting 350hp at 7200rpm and 397Nm at 4800rpm. The 380RS also receives exterior make over that creates more downforce and benefits stability at high speed and cornering. The race car on display was Team JR Motorsports Nissan GT-R GT1 (#23) driven by Michael Krumm and Lucas Luhr. They won the Drivers' Championship title with this GT-R GT1 in 2011 FIA GT1 World Championship. It was an excellent result for Nismo, a Japanese representative contender against other European GT1 machines like Aston Martin DBR9, Ford GT1, Lamborghini Murcielago R-SV and Corvette C6.R. In order to fulfill FIA GT1 technical regulation, Nismo completely redesigned the GT-R. The standard 3.8L VR38DETT twin-turbo V6 engine was replaced with 5.6L VK56DE natural aspirated V8 engine. 590hp and 649.9Nm of torque directing to its rear-wheel drivetrain. That's a Volk Racing centerlock forged magnesium wheels by RAYS Engineering, commonly used in Nismo GT-R GT500 in SuperGT. All four wheels were wrapped in Michelin 31/71-R18 slick tyres connected to Brembo 6-pot calipers braking system. After much drooling over Michael Krumm's machine, it was time to join the SuperGT fans and watch actual Michael Krumm in action! It was probably one of the best race I watched in years. The most exciting part was on the final lap, where S Road GT-R was working real hard to steal the no.1 spot from Epson HSV-010 GT. Watch the video above and see how the fans reacted to the WIN! Everyone left after the superb result by Nissan team in Round 7 Autopolis, leaving me an excellent position to grab few more shots. The Nismo employees also handed out Nismo posters and stickers to fans who stayed throughout the race. Great guys they are. The winning car in 2011 FIA GT1 World Championship! I had a memorable experience visiting the original Omori Factory where the Nismo 400R, Z-Tune and others were born. However, my first time visit was also the last time because, this store was officially relocated to Tsurumi, Yokohama early 2013. The new Nismo Omori Factory has a bigger space and more demo cars could be fitted in for display. I'd definitely mark this place in my 'Must-Visit-Place-in-Japan' list and you should too. More info on the new Nismo Omori Factory: Here and here. I have a 2102 GT-R Black Edition. My son and I love that car. He was 23 when I bought him this GT-R. He earned his CPA license working for Pricewaterhouse Cooper back in 2012. He and I will visit Japan via Signet Tour from Nov 8 through Nov 18. According to the itinerary, we will have some free time in Tokyo. We would love to come to the Nissan Nismo plant to tour the leading-edge site. We love to buy some souvenirs too. Please let me know if the plant is open for public tours during that week. I look forward to meeting the team who made this MOST DELIGHTFUL machine for us. Thank you so much!! Hi Paul Fung! Thank you for your reply. Awesome, you have a Black Edition GT-R and great to hear that you'll be visiting Japan. Nismo Omori Factory is open for public except on the Monday. Regarding your enquiry on special tour (non public), I am not sure as I visit as normal public. You can get more information or possible contact from links here and here. Hope it helps. I do not need personalized tours. We would love to visit every facet of the manufacturing process and the types of souvenirs I can purchase to take home to add value to our beloved GT-R. My son would like to get clothing and personal items that would complement his undaunted love for this Black Edition. We look forward to seeing you and the wonderful GT-R team in November. hello is this one in Yokohama? . I got told there is now two factory's. I am having a hard time to find the second one. Hi Aaron! Regarding the 2nd factory, I believe it's where they keep the engines. I remember reading it online before. But, that's like super top secret. ^^"
1/1 Toyota Sprinter Trueno AE86 Hayashi86 Ver.